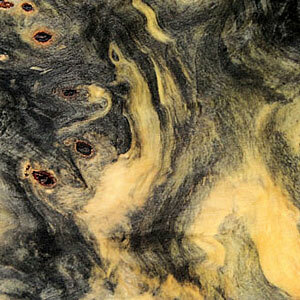 Buckeye Burl is one of our most dramatic woods. The sapwood in our Buckeye Burl tends to be creamy, yellowish, or somewhat darker, and the heartwood is white to blueish-gray — a most desirable color. Buckeye Burl is a soft, lightweight wood with a fine grain that works well with hand tools. It is challenging to bore, shape, or turn Buckeye with machine tools, but if you can manage, we have seen some turned pieces that are spectacular. Buckeye can produce a very nice finish. Buckeye is used for furniture, artificial limbs, signs, food containers, decorative items, and more. Because Buckeye Burl is primarily a root, it may have rocks and sand pockets that are hidden inside and not detectable until turned. Be careful!